Rejoice! 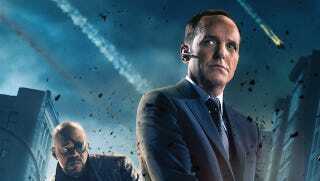 Agent Coulson will be in the new S.H.I.E.L.D. TV series! Ever since we heard about Joss Whedon's S.H.I.E.L.D. TV show, we've been hoping against hope that Clark Gregg's Agent Coulson would appear, despite the events of The Avengers. At today's Marvel television panel, Joss Whedon and Kevin Feige announced that Clark Gregg will in fact be headlining S.H.I.E.L.D..
"We all love Clark Gregg, there's no doubt about that," Whedon said. "From before we made 'The Avengers,' we discussed whether there was a way for him to be a part of the Marvel Universe, perhaps a part of a TV show even after his death. … The fact of the matter is, as much as we love him, now that I'm really running Marvel, I like to keep a type of artistic integrity, which means we don't stretch the bounds of reality." "There was never going to be a 'S.H.I.E.L.D.' show without Agent Phil Coulson!" said Feige, who appeared behind Whedon, wearing a COULSON LIVES shirt. "He's headlining the S.H.I.E.L.D. show and always was." said Whedon. Jumping up and down! We could not be looking forward to this show more. Head over to CBR for more Marvel TV coverage.